You are not authorized to access this page for The Mighty Labs section.. Maybe only for people who donated it ? Kinda looks like those rabbit robots from Gundam Seed, if I remember correctly. Whatever they were called. Reminds me a lot of Elekid from Pokemon. Oh yeah I can see that yeah. There's the AC plug on the head maybe if you push it (and I mean push it) the arms aaaaand that's it. Sure is a lot to be reminded of. Why do you Pokefreaks gotta see your stuff in everything? Protodude, in the e-mail I got, they also announced the winner of the "Stage Start" contest, which was the generic "Systems Ready?.....Go!" I was wondering if you will update the post with that? Just a suggestion. So creative! good thing you didn't donate a dime. Yes, because "Beck" or "Call" are far more creative. But I love how the first thing anyone says is "You didn't donate so your input is invalid". Okay, sure. Let's go with that. Nothing I have to say holds any water because I didn't donate anything to the project. So why pay any attention to begin with? Just to go "Ha hah, I donated and you didn't"? If that's the kind of attitude the people who donated to this project have, then I'm even more glad I didn't bother. And I supposed Rock and Roll are the pinacle of creative genius? Geeze, dude. You're becoming almost as bad as Professor Megaman and the Archie comics. That said, I do with I could provide some input to this contest despite my not having the money to donate at the time. Still, I'm not acting all butthurt about it on every post. That thing reminds me of a Deku but techno. Just thought I'd add my personal remind me of reference for the sake of hipness and Zelda. 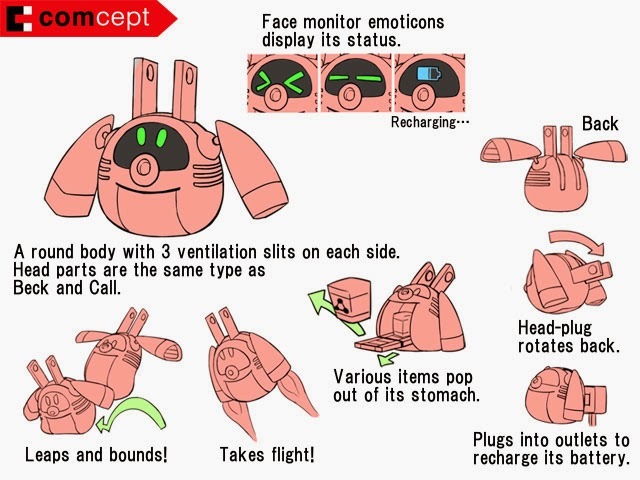 ITS A LITTLE ROBOT PIG ITS SO CUTE!!! Call him Server (As in both servant and computer server) and make him orange.